I love spending my summer reading, so I thought it would be fitting for me to share my reading tips and some of my favorite fun summer books. 1) Use GoodReads: This website allows you to track what you have read, what you are currently reading, and what you want to read in the future. It also allows you to connect with your friends, so that they can keep you motivated. 2) Get Books from the Library: It is so much easier to read lots of books when you don't have to pay for them. Books today cost around $8-$12 dollars each and that can quickly add up. Your local library most likely has all the books you want to read and for free! 3) Find a Comfortable Place to Read: On the couch, in your bed, or outside find where you are most comfortable and read there. It will make you able to concentrate and focus on the book more and it's a great way to just relax and unwind. 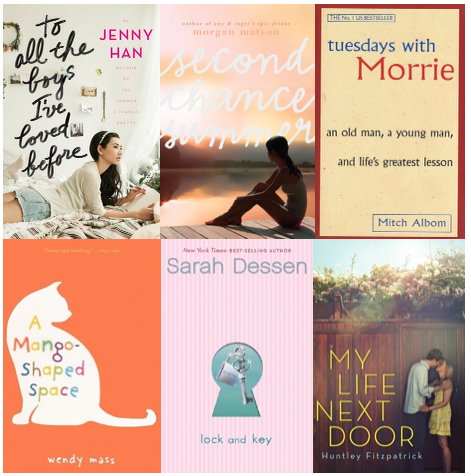 4) Get Books that Match your Interests: I like books about history and also I love young adult romance books(like the top 5 down below). Those are my interests, so I read books that relate to that. If you like science or cooking read books related to that. Don't just read bestsellers because you feel like that's the right thing to do; really read what you are interested in or you won't end up reading at all. 5) Make it Fun: Get a friend that also wants to read and read the same books. It will be fun, because you can discuss them together. Investigate the characters and the author, really dig into the fun parts of the novel. Also, read fun books; don't read anything that you would read in school(unless it is required or that's your interest). 6) Don't Make it a Requirement: Read when you have time. Don't set a requirement for how much you are going to read each day. When you want to relax or you have some down time read then, you'll be surprised at how often you get sucked into a book and read for hours without stopping. 7) Don't be Afraid to Curl Up and Read a Whole Book: There will be some days when you just can't stop reading a book. Just keep reading it; don't worry about a day wasted reading it is very needed sometimes, especially during the summer when you are out doing things everyday. Want to Follow What I am Reading?